One of the hats I wear in the AMT Marketing department is that of resident photographer. That means I get to snap photos of group tours that come to AMT, photos of the AMT band for our Original Shows programs, and really anything else that comes along. It also means that I get to shoot choice celebrity concerts for our archival use. And with that, I thought I’d share some of my favorite photos from our vast selection. 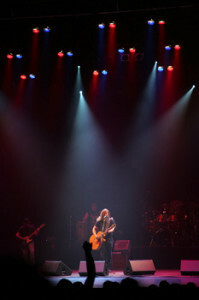 Recently, we had Country singer Jamey Johnson on stage. Jamey’s set definitely did not disappoint his faithful fans in the audience, and it hooked me into being a fan of the act. We were no more than 2 bars into his second song and fans were already clamoring, because they recognized, and loved, the tune being played. Though the song wasn’t musically intense (lyrically is another story), the picture to the right was taken at the start of that song and showcases just how into it they were. 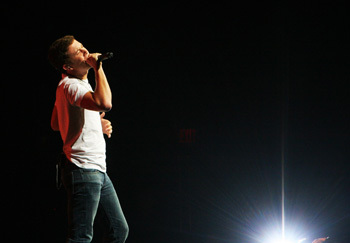 In July, we had American Idol Scotty McCreery play to a pumped-up sold-out crowd. Wearing a plain white t-shirt, jeans, and cowboy boots, it led you to think he would put on a nice, relaxed performance. Instead, he bolted around the stage like a madman (in a good way) – clearly having fun and using the crowd’s energy to fuel his show. Here’s a shot that shows the emotion and heart Scotty puts into his performances, and it doesn’t hurt that I think the shot came out great, either. We bring a lot of legendary acts to Central PA, which makes for a lot of great memories. 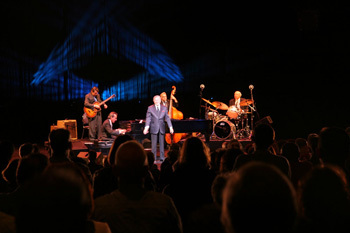 But I was particularly excited to be able to shoot the Tony Bennett show we had last Summer. It really says something about the show when a performer gets a standing ovation at the end of their night, but to get the same standing ovation to start the show, is something special. That happened during Tony’s show and he, along with his tight backing band, proceeded to tear through many songs we all know and love. If you’d like to peruse our archives, visit us on Flickr and Facebook page to check them out.